10 negatives : b&w; ; 120 mm. Published in Rafu Shimpo, September 23, 1968. 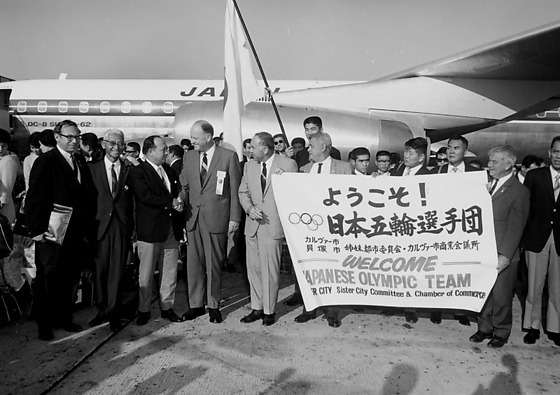 Japanese Olympians welcomed by Kaizuka, Japan-Sister City Committee and Chamber of Commerce of Culver City at the Los Angeles International Airport (LAX) in Los Angeles and at the Veterans Memorial Hall (VMH) in Culver City, California, September 22, 1968. The athletes wear jackets with Olympic rings, Japanese flag and "Japan" on left breast pocket. 1P and 8N: Group of men in suits stand in a row as a Caucasian man, probably Culver City Mayor James Astle, Jr. and Japanese man shake hands at left at LAX. Men at right hold a large sign in Japanese and English, "Welcome Japanese Olympic Team, Culver City Sister City Committee & Chamber of Commerce". Frank Wada, white-haired and eyeglasses, stands smiling second from left. Tall young Japanese man holds Japanese flag in midground, center amongst crowd. Japan Air Lines airplane in background. 2P and 9N: Japanese Olympians disembarking Japan Air Lines airplane, led by tall young man holding a Japanese flag at LAX. Fred Wada, white-haired man in suit with back to viewer, stands in center greeting athletes. The athletes all wear dark jackets and light colored pants. 3P and 7N: Japanese Olympic athletes sit in auditorium looking at panel in foreground at the VMH. 4N: Japanese Olympic athletes receiving gifts, perhaps food, as they enter room. Two women stand behind table distributing white boxes stacked on table at right. 5N: Older Japanese man wearing Japanese Olympic jacket stands at microphone with Olympic flag at right at VMH. A smaller Japanese man in suit stands beside him. Two Caucasian men and a Japanese man sit at table next to microphone. Curtains in background. 6N: Japanese man wearing Japanese Olympic jacket presents a pin and scroll to Fred Wada at VMH. Microphone and podium in foreground. Curtains in background. 11N: Man speaks into microphone at podium flanked by men in Japanese Olympic jackets at left and Caucasian and Japanese American men in suits at right at VMH. Fruit baskets with Japanese labels sit on stage. Sign, "Welcome Japanese Olympic Team, Culver City Sister City Committee & Chamber of Commerce", hangs in background flanked by Japanese and American flags. 12N: Six Caucasian and Japanese American men kneel on stage behind fruit baskets with Japanese labels, flanked by American and Japanese flags at VMH. Sign, "Welcome Japanese Olympic Team, Culver City Sister City Committee & Chamber of Commerce", in background. Typed on original envelope: Olympic from Japan -- Mr. Isamu Wada.